BEIJING/WASHINGTON -- China, as expected by the Trump administration, said it will temporarily suspend additional 25 percent tariffs on U.S.-made vehicles and auto parts starting Jan. 1, 2019, following a truce in a trade war between the world's two largest economies. The Ministry of Finance, in a statement on its website Friday, also said it hopes China and the United States can speed up negotiations to remove all additional tariffs on each other's goods as it reduces tariffs from 40 percent to the 15 percent level that was levied before the current trade fight began. The suspension will last for three months. U.S. President Donald Trump welcomed the announcement. "China just announced that their economy is growing much slower than anticipated because of our Trade War with them. They have just suspended U.S. Tariff Hikes," Trump said in a tweet. "U.S. is doing very well. China wants to make a big and very comprehensive deal. It could happen, and rather soon!" Shortly after the Chinese announcement, Tesla Inc. said it had cut prices on its Model S and Model X vehicles in China. 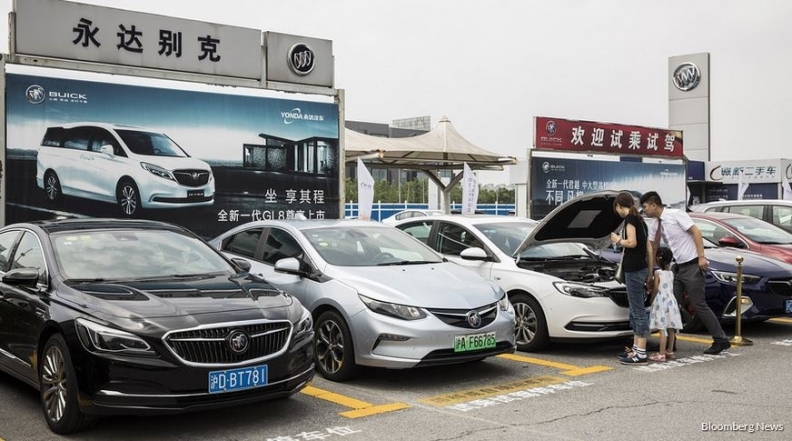 "This is a good signal that China and the United States are on track to solve the trade war," said Wang Cun, director of the China Automobile Dealers Association's import committee. "Car makers might be ordering a large number of imported cars now." Joe Hinrichs, president of Ford Motor Co.'s global operations, also welcomed Beijing's announcement, noting that the U.S. automaker exported nearly 50,000 U.S.-built vehicles to China in 2017. "We applaud both governments for working together constructively to reduce trade barriers and open markets," Hinrichs said. In July, China hiked its tariffs on U.S. autos and parts after the United States raised its tariffs on Chinese vehicles and parts to 27.5 percent. Automakers do not expect the United States to immediately cut its higher tariffs on Chinese imports in response to China's move. Auto exports between the two countries are relatively small. China exported 53,300 vehicles to the U.S. market last year and imported 280,208 U.S. manufactured vehicles, according to data from the China Automotive Technology and Research Center (CATARC), a government-affiliated think-tank. In contrast, in the first 11 months of this year, China produced 25.3 million cars, down 2.6 percent from the same period last year, industry figures showed. Wang said automakers in China that imported cars from the United States had seen a 30 percent decline in volume in the first 10 months of 2018, but the tariff cut would bring imports back to previous levels. German automaker BMW said it welcomes the temporary reduction of tariffs on vehicles imported to China from the United States, adding it is in talks with partners in China how to respond. The financial impact by fees in China for cars imported from the United States is expected to amount to almost 300 million euros ($338 million) for the BMW Group in 2018, the company has said. BMW announced on Saturday that it was cutting its China prices on four U.S.-made models by between 3 and 7 percent: the X5, X6, X5M and X6M. The latest announcement on the planned tariff suspension followed China's first major purchase of U.S. soybeans since Trump and his Chinese counterpart Xi Jinping's landmark talks on trade in Argentina on Dec. 1. China's tariff cut was communicated earlier this week during a phone call between Vice Premier Liu He, U.S. Trade Representative Robert Lighthizer and U.S. Treasury Secretary Steven Mnuchin, a Trump administration official said. China will now suspend 25 percent tariffs on 144 U.S. vehicle and auto part items and 5 percent tariffs on 67 auto items between Jan. 1 and March 31, the Chinese finance ministry said.